When browsing through hundred-year-old magazines, I’m sometimes surprised by the recipes I find. This is one of those times. 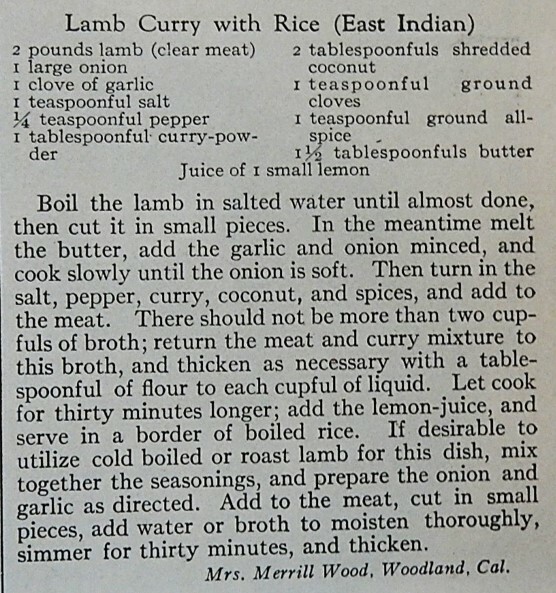 I was amazed to find a recipe for Lamb Curry with Rice (East Indian) in the April, 1917 issue of Good Housekeeping that had been submitted by a reader. 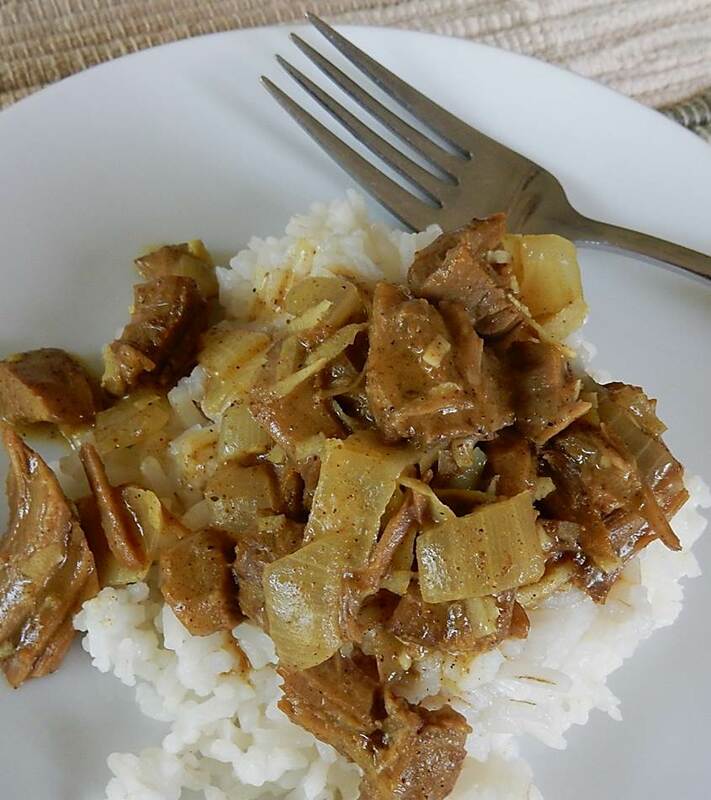 This recipe makes a very credible Lamb Curry. I’m not an expert on Indian foods (and feel free to disagree), but to me, it tasted similar to some of the milder lamb curries that I’ve eaten in restaurants over the years. Which led me to wonder, who was the woman who submitted this recipe to the magazine? Did she have friends from India? Had she visited India? Melt the butter in a skillet using medium heat, and stir in the onion and garlic. Cook until the onion and garlic are soft; then add the cooked lamb. Stir in the flour, pepper, curry powder, cloves, and allspice. Slowly add the lamb broth while stirring constantly; bring to a boil. Add the coconut and lemon juice. Then reduce heat and simmer until the sauce has a thick gravy-like consistency. Remove from heat and serve with rice. Posted on July 2, 2017 July 1, 2017 by SherylPosted in FoodTagged lamb, recipes. Next Next post: Are Bananas Good for Us? Interesting how worldly magazine readers were 100 years ago, considering there was no internet or easy transportation. It always surprises me how many people went abroad or off to the seashore for the summer when it must have taken so much more time and effort back then. I’m also surprised how many people took long trips back then. I”m sure that they wrote post cards and letters to stay in touch, but people must have felt much more comfortable being “disconnected” from the day-to-day activities of their friends, family, and work colleagues. This looks like a more westernized version of Indian curry. Maybe she had British relatives – the ones who served in India adapted quite a lot of the foods and brought it back with them to England. This scenario makes a lot of sense to me. It’s so easy to not think about it today, but India was part of the British empire until 1947. (I just looked the year up on Wikipedia). There have been huge changes in the landscape of countries across the past hundred years. Love the recipes you find. Hard to believe 100 years has passed, yet the recipes are still around. Love that. I didn’t even know they ate lamb in 1917. That’s interesting. Wonder if my relatives born then ate lamb. Pretty neat to consider what they ate. Hope you are doing well. Have a nice day. My general sense is that people in some areas and regions regularly ate lamb (and mutton) a hundred years ago. I don’t think that it was nearly as expensive as it is today, and that mutton at least was a very cheap meat. I’ll pass on the lamb. I just don’t like it, even after having been assured that if I try “this” or “that” I’ll become a fan. But if you ever need a recipe for a good beef curry, I’ve got it. A friend who was Peace Corps India brought back some recipes, and they all were delicious. Mmm. . . I like lamb, but beef curry sounds wonderful. People who have lived abroad often discover some really special recipes. I wish my husband liked lamb because this looks delicious. It really was quite tasty – though if your husband doesn’t like lamb, it’s probably not a recipe for your family. Commenting late per usual – love lamb, it is our (via hubby’s family) traditional Thanksgiving meat, not turkey. This looks like a fun one to do mid-way to “turkey day”! It was a fun, easy recipe. I’m curious about origin of your huband’s famiy tradition of serving lamb on Thanksgiving. It sounds like a nice change from turkey – but it’s the first that I’ve ever heard of it.